The hearts we used for valentines, barely made a dint in the bag so we pulled them out again to create some art for the baby room and to mail to Boma. Rose enjoyed drawing around her hand. And gluing was definitely a hit. Resulting a lovely bright, tree collage. Daisy spent a bit more time colouring her hand and adding detail to her tree by hand. 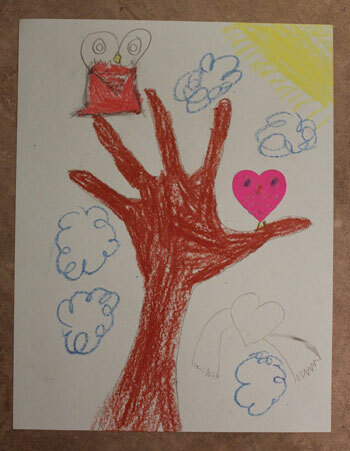 She was equally proud of her tree and owl collage which incorporated hearts. Using their hands as tree trunks, Rose helped find green hearts and glue them on. Now little brother, when he arrives, has his sisters art on his wall. What do you do with your left over hearts and valentine’s decorations? Thank you Little Fingers Big Art!